View this sample resume for a personal assistant, or download the personal assistant resume template in Word. If your career could use some assistance, creating a well-organized resume should be at the top of your to-do list. A comprehensive resume can help you be considered for top personal assistant jobs, says resume expert Kim Isaacs. 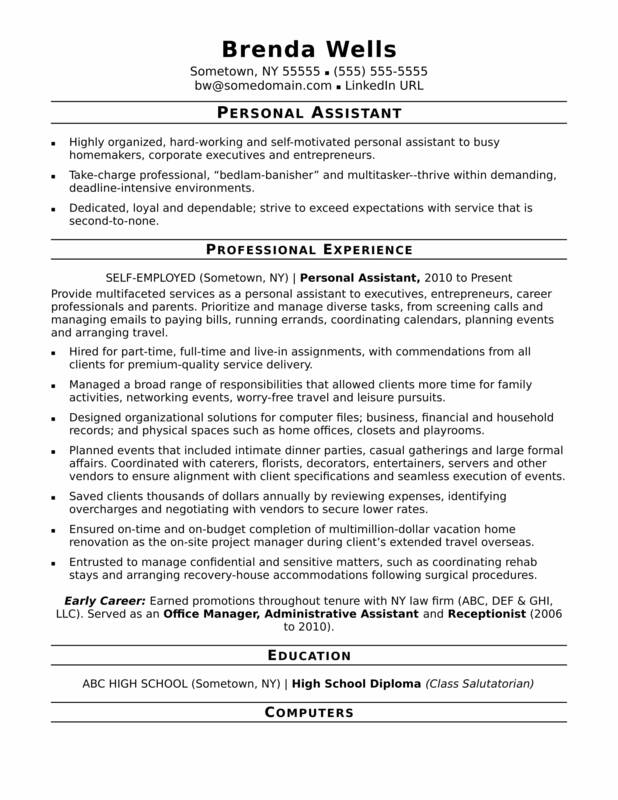 For resume writing tips, view this sample resume for a personal assistant that Isaacs created below, or download the personal assistant resume template in Word. And if you need more help, get a free resume evaluation today from the experts at Monster's Resume Writing Service. According to the Bureau of Labor Statistics (BLS), a high school diploma or equivalent should be sufficient to land a job as a personal assistant. In this role, you can expect to make a median wage of $37,870 per year, or $18.21 per hour, per the BLS. You’ll find the highest level of employment for this job in the following states: California, New York, Texas, Florida, and Pennsylvania; and in the following metropolitan areas: New York City, Los Angeles, Houston, Chicago, and Washington, D.C. Additionally, you can search for personal assistant jobs on Monster. Highly organized, hard-working and self-motivated personal assistant to busy homemakers, corporate executives and entrepreneurs. Take-charge professional, “bedlam-banisher” and multitasker--thrive within demanding, deadline-intensive environments. Dedicated, loyal and dependable; strive to exceed expectations with service that is second-to-none. Provide multifaceted services as a personal assistant to executives, entrepreneurs, career professionals and parents. Prioritize and manage diverse tasks, from screening calls and managing emails to paying bills, running errands, coordinating calendars, planning events and arranging travel. Hired for part-time, full-time and live-in assignments, with commendations from all clients for premium-quality service delivery. Managed a broad range of responsibilities that allowed clients more time for family activities, networking events, worry-free travel and leisure pursuits. Designed organizational solutions for computer files; business, financial and household records; and physical spaces such as home offices, closets and playrooms. Planned events that included intimate dinner parties, casual gatherings and large formal affairs. Coordinated with caterers, florists, decorators, entertainers, servers and other vendors to ensure alignment with client specifications and seamless execution of events. Saved clients thousands of dollars annually by reviewing expenses, identifying overcharges and negotiating with vendors to secure lower rates. Ensured on-time and on-budget completion of multimillion-dollar vacation home renovation as the on-site project manager during client’s extended travel overseas. Entrusted to manage confidential and sensitive matters, such as coordinating rehab stays and arranging recovery-house accommodations following surgical procedures. Early Career: Earned promotions throughout tenure with NY law firm (ABC, DEF & GHI, LLC). Served as an Office Manager, Administrative Assistant and Receptionist (2006 to 2010).